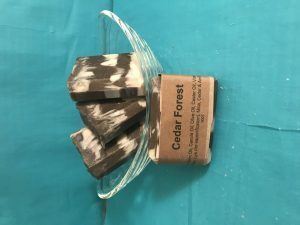 Short Product Description: 3.3 oz charcoal soap with bits of dried lavender for exfoliation. Tested on a person…this person. I grow the lavender, mix and cook and press, and use this soap daily. 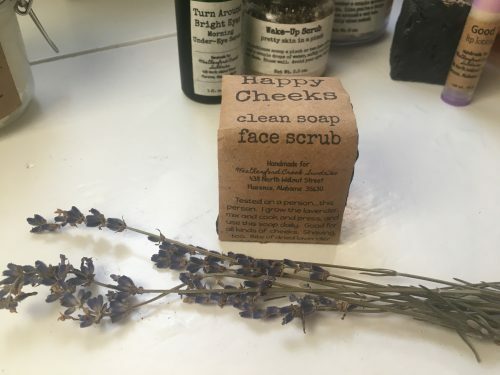 Good for all kinds of cheeks. Shaving, too. Bits of dried lavender exfoliate and smooth. Scrub carefully…dried bits can scratch if you don’t let the soap do the work! For best results, let soap dry completely on a wooden soap dish between uses. Charcoal can be messy…comes clean with water.